While you have it, would you measure it and post the angles and dimensions? I'd especially be interested in the distance from the seatpost to the hoods (measured horizontally from center of the seatpost to where the hand would rest, where the hood starts to curve upwards). Also, the seat to hood drop would be interesting. Of course, there is the question of whether this is how Andy had the bike set up back then. I wish I had taken the numbers from the Motorola Merckx when I had it. I've seen a napkin drawing from Slawta that shows, I think, 74º parallel with 35mm of fork rake - not how I would design a bike but it seemed to work. After Andy started working with Merckx, Eddy got him to lower his saddle and stretch out more along the top tube, which I think was reflected in the Motorola bikes that you and I got from Andy. 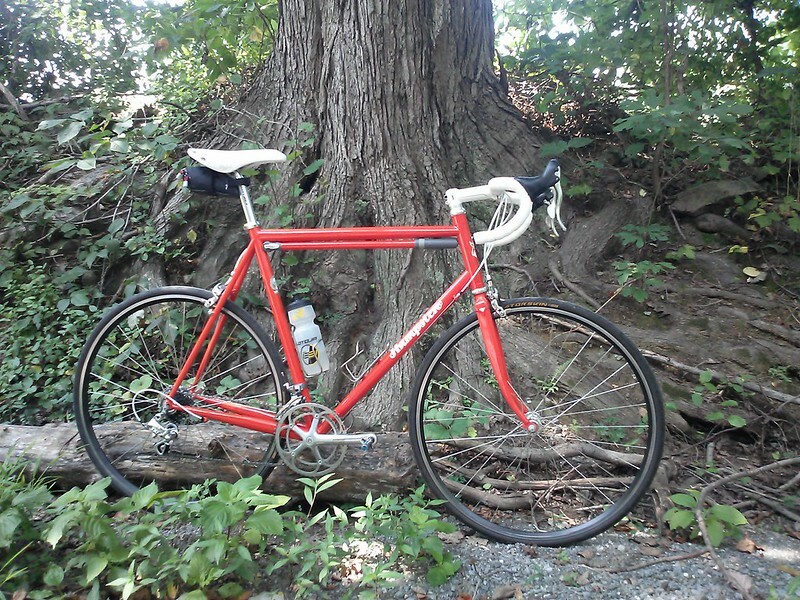 I have a new to me Hampsten Titanio incoming bought off of this Forum. I am attaching the geometry sheet. Looking at the sheet it appears that the frame was designed for a fork with a 45mm offset and an axle to crown measurement of 384.5? Am I reading this correctly? Also, according the the seller the specified fork was an Ouzo Pro with an axle to crown measurement of 372. Finally, I want to change the fork to an Enve 2.0 (I am a little wary of used carbon components). Considering theititanio.jpgaxle to crown measures 367 on the Enve, what rake would be the closest to the original spec in trail? The 384.5mm appears to include the thickness for the external lower headset cup (13.7mm for a king). An Enve fork with 45mm of rake along with a King +5mm lower race would solve all of your problems, as this was originally designed for an Reynolds fork with a CRH of 372mm. And, coughcough, the main forum might be a better place for this discussion as Smoked Out is dedicated to outlining how wonderful I am. Next time... and enjoy the frame! And you forgot to mention how good lookin too. Or better than the Enve, have Steve build you a custom fork. Ask me how I know. Oddly enough we seem to do a fair number of forks here, both replacement (or supplemental) and as original equipment with new frames. The newest trend seems to be either MAX forks or forks with threaded steerers - remember those? No threaded MAX forks yet but I know that will change when someone reads this. Steel threaded fork on a Hampco, check. It's amazing how that vertical adjustability helps in fitting the bike. And you can find quill stems that open, to make that easier too. I just couldn't find the right length in the right color. It even worked with the trials for my new asymmetrical bag design. Last edited by thollandpe; 12-31-2018 at 08:23 AM. Well Mr. Hampco, I think the Max profile forks work well with oversized steel tubes and are one of the few steel forks that work with Ti frames. I think you need to show us a few shots of Maximillian style forks from Martin. Can you fillet weld a Max fork or must it be lugged? That's a good question and I'll say that given the shape of the blades we'll have best results using a cast crown. Others may differ and that's fine. Dang! Classic Red. Great looking bike. Moke is on point about Columbus Max forks going well with larger tube diameters seen on some Ti and oversized tube steel bikes. That Max fork looks like a good match for that Ti bike. The wide profile of the blades goes well with these tube diameters. Any idea what the down tube diameter is on the Ti bike above, or even on that red Hampco bike? I'll guess the ti frame uses a 38mm down tube; the red bike looks like it has the 35mm MAX down tube. I'm using a more 38mm MAX DTs these days and our ti frames often sport 41.3 and 44mm down tubes.